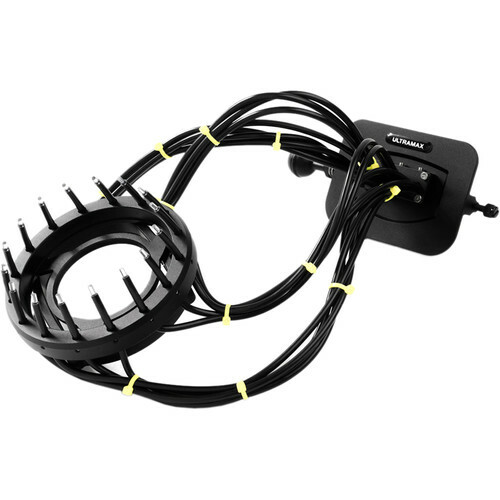 Turn your underwater strobe into a ring light with ULTRAMAX's Fiber-Optic Ring Flash Head Kit, which can be mounted onto the Fantasea FP7100, FG16, FG7X, and FG7X II housings for the Nikon Coolpix P7100 and the Canon G16, G7 X, and G7 X Mark II cameras. The apparatus is compatible with the ULTRAMAX ULTRAPOWER UXDS-3 Strobe, which is required but not shipped with the kit. The ring flash head is ideal for macro and super-macro shooting, and even allows for the attachment of accessory close-up lenses via the 67mm threads on the ring. At one end of the unit is a large, anodized aluminum cap that fits over the front of your strobe. When the flash fires, sixteen coated, tightly-bundled fiber-optic cables transfer the light to the other end of the apparatus. There, the solid-core ends of the cables are arranged in a circle along the edge of the anodized aluminum ring that fits around your housing's lens port. The light comes through the ends of the cables, creating the ring flash effect. Attached to the cap at the opposite end is a standard 1" ball mount, which can be connected to a cold shoe-to-ball adapter on top of the housing via the optional clamp. This setup will hold the strobe and the ring flash kit securely in place. When you want to use your flash as a regular external light source again, you'll be able to remove it from the fiber-optic ring apparatus with ease.